The Left is only too willing to assume guilt before proven innocent. They’ve been doing that with Trump for two years now. I’m so ashamed of them. 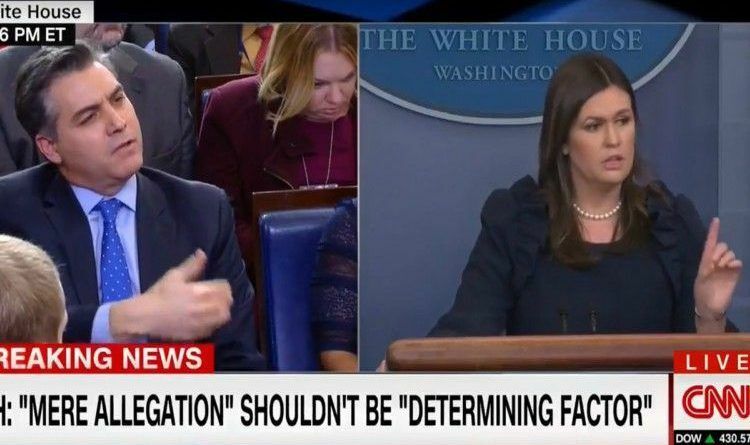 On Monday, White House Press Secretary Sarah Huckabee Sanders slammed CNN’s Jim Acosta for his assertions that President Trump was “tone deaf” on issues relating to domestic violence and sexual misconduct. “The President’s tweet over the weekend, ‘People’s lives are being shattered and destroyed by a mere allegation.’ […] Why did the President tweet that over the weekend?” asked CNN’s senior White House correspondent. “The President’s simply saying there should be a due process that should be followed… I don’t think the President supporting due process is tone deaf. It’s allowing things to be investigated and not a mere allegation to be a determining factor,” she added. “Anybody here, if they were accused of something, would want the opportunity to go through due process,” said the Press Secretary, shouting down Acosta’s objections. Sarah is correct, an allegation is just that….there are not yet facts produced to support it. After all, they allowed Bill Clinton to remain President and there was plenty of proof, not just mere allegations. They allowed Hillary Clinton to run for President while she was still being investigated and would have probably been found guilty if there wasn’t a s*** load of people covering up for her!! So, why is it ok for everyone else in the political arena to get away with crimes and not be raked over the coals unless you are President Trump or have some affiliation with him?